Red is such a powerful color. In Asian culture, the color red symbolizes good fortune and joy. During the holiday season, the color is synonymous with Christmas. And for the rest of us, the color is associated with strength, passion and love. I haven't owned a bold red outfit that conveys such conviction of self (yet), but until that day arrives I find it appropriate to pop with accents of such a strong color. 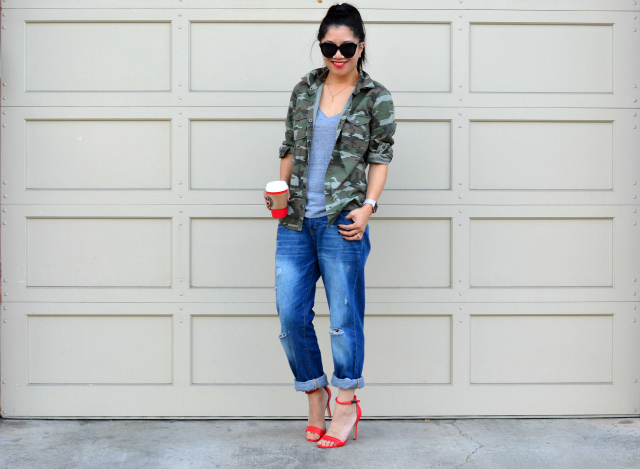 Those heels are fabulous and so chic paired with boyfriend jeans and camo shirt. I LOVE a strong pop of red! That camo jacket is perfect! Red is definitely a lucky color for Asians and we see it everywhere for any happy oocasion. 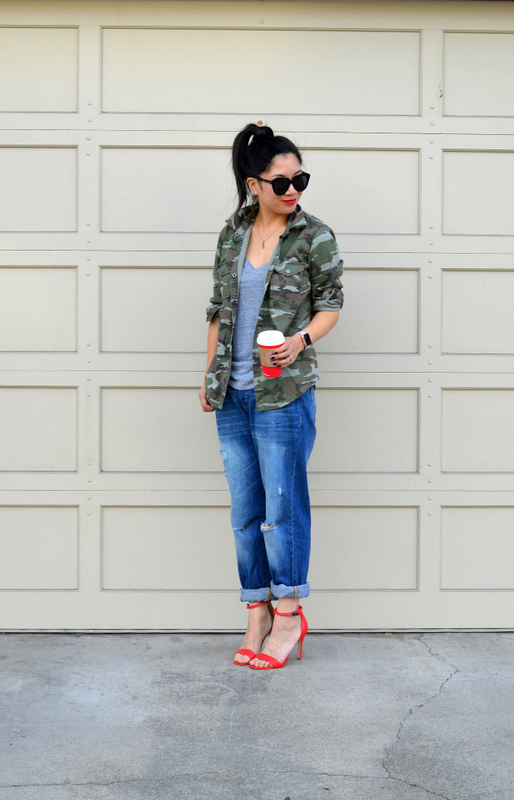 Love how the red heels totally glam up this camo jacket and jeans look. Red is such a beautiful color, but it can be so daunting sometimes. Wearing a head to toe red outfit is on my style bucket list...one day! Love love love those shoes! You don't need red head to toe, those pumps are plenty on their own and they appear to give you plenty of conviction, I think. What a gorgeous laid-back look! Those red accents give the outfit such a chic vibe! gorgeous outfit! love the boyfriend jeans and of course, the sandals! 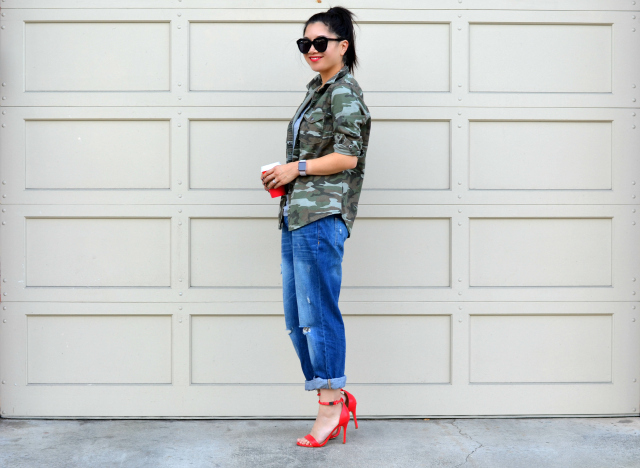 Your camo jacket is so cute with the pops of red! Love to twin with you on our love for red details - Have a wonderful Thanksgiving!!! If only I could pull this off- I love those shoes! I remember when I was going on college interviews someone told me to wear red or red accents because it symbolized power/success. I adore red shoes! These are so pretty and I love how they go with your casual camo top! great outfit for the weekend! Obsessed with this! I love those shoes, and they are such a fun girly contrast to your bf jeans, tee, and jacket. I don't own much red besides accessories either. Big fan of the color red--it is very powerful. I love your little bits of red in this outfit. I love everything about this look especially the bright red color of those shoes!!!! Girl, that outfit is killer! I love the camo jacket, but I feel like I could never pull it off as well as you. 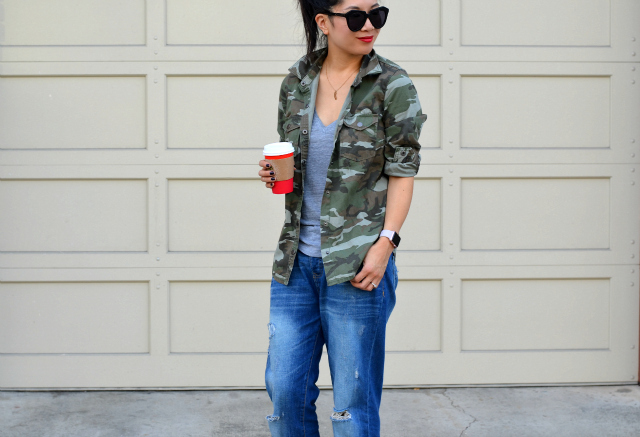 love the camo and heels combo! so cute! The pop of red in your outfit is so much fun...and I kind of love how well your Starbucks cup matches! Love the boyfriend style outfit with the red heals! Good eye! I'm loving your red heels with your camo jacket! Adding those feminine heels softens up your cool, casual look. What a great idea! That outfit ROCKS! Love the camo jacket, jeans and those heals.